In truth, at the time I didn't really know enough about the Hungarian economy to hold a strong opinion, but I was struck by the peculiar and combustible mixture of problems that the country seemed to be facing, with deficits everywhere (both fiscal and current account), private individuals who seemed to be addicted to the contraction of non-local currency debt (largely in Swiss Francs) at a rather alarming rate, a central bank which seemed to be condemned to try and drain the ocean with a teaspoon given the limitations and strong headwinds they faced when trying to implement standard monetary policy in the face of the new rules of financial globalisation, and a population which was falling due to both the low fertility level, and the comparatively low level of male life expectancy which existed (something which complicates enormously the normal policy remedy for ageing workforces of increasing the employment participation rates of the over 60 age group). This is the second report issued about Hungary by a major investment bank in quick succession (the other was Merill Lynch), and both of them have drawn attention to the combination of stagnant growth and high inflation under which Hungarian policy is labouring. 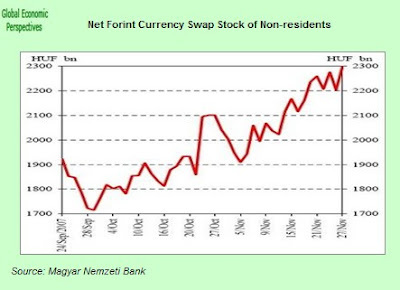 The difficulty is that the need to maintain the value of the forint at or near its present levels (or otherwise all those with external debts - mainly households - will start to experience what they call in the parlance "distress". So no one anticipates drastic moves in monetary policy - which the situation surely merits, just look how the Fed is responding to a much milder problem in the US - and interest rate easing moves are expected to be limited. Paribas si - even in the face of the near recession call - sticking to its outlook for an interest rate reduction to 6.5%, while Merrill Lynch is predicting an even more aggressive reduction to 6.25%. None of this, of course, will be to the liking of yield driven financial investors, and the forint will certainly become rapidly vulnerable as monetary policy steadily moves down this path as it surely has to. The growing unease about higher risk instruments in the context of the ongoing global credit squeeze is undoubtedly the main driving force behind the sale of the Hungarian instruments, this and a growing wariness about Hungary's vulnerability in the face of a global downturn. 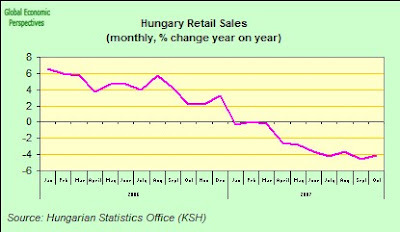 Hungary's recent macroeconomic performance and the absence of any sort of optimistic outlook have undoubtedly also played a role, and in particular the high level of external indebtedness of individual Hungarian citizens, the high current account deficit, the weak internal demand situation and the general concerns about ongoing and long lasting slow economic growth. The central bank's figures reveal that foreign investors divested large amounts of Hungarian stocks in November (continuing a trend that really got started back in August). According to Portfolio Hungary - who have examined the available information on ownership structures and share prices, OTP and Magyar Telekom are likely to have borne the brunt of the sell off. One possible explanation for this surprising situation is the rage for foreign currency denominated consumer loans that continues to grip Hungary. The volume of new mortgage loans climbed to the previously unseen level of HUF 130 bn in October, and this increase was almost exclusively attributable to the increase in CHF-denominated loans (HUF 120 bn). 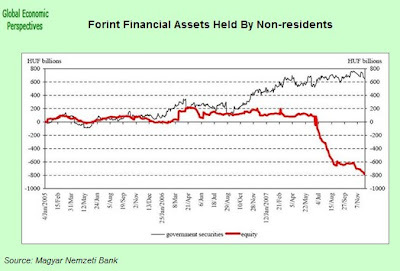 Detailed data from the National Bank show that while the monthly amount of new CHF-denominated housing loans rose to the exceptional level of HUF 55-60 bn, mortgage loans for consumption purrposes (ie "refis" or liquidity extraction, not to buy houses) became almost inexplicably fashionable, rising by 30% month-on-month to reach the unprecedented level of HUF 62.5 bn. Clearly this situation is now really very very delicate, one strong push and a whole pack of cards can come tumbling down. Borrowing today to pay back yesterday is a dangerous policy at the best of time, but when your currency might be about to fall of a cliff (think what happens when the demand for new loans dries up) it has to border on recklessness if you are borrowing unhedged in another currency. And remember, when the bonfire starts (not the one of our vanities I hope) in Eastern Europe (and it may not start in Hungary at all in the first place) it will undoubtedly rapidly spread from one of the "at risk" countries to another. 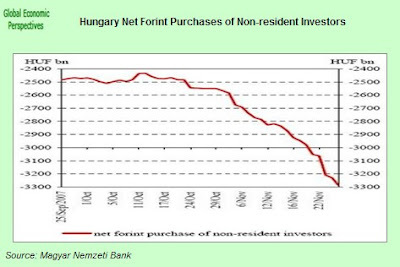 What all this suggests to me is that a lot of Hungarians are trying to maintain current consumption by borrowing forward aginst their homes (ie some sort of "consumption smoothing) in the hope and expectation that rising property values in the future will help them sweat off the debt. If this rise does not materialise, then the very least that can be said is that all of this will need, at some point, to be clawed back from current consumption. All of this also represents a new form of moral hazard for the central bankers over at the ECB and indeed for the EU Commission itself, since all this borrowing in Swiss Francs has to be based on the assumption that with so many people doing it the Hungarian authorities will never dare to let the forint slide (you know, there's safety in numbers) or, pushing the buck back one stage further, the EU Commission and the ECB won't let the worst things come to the worst. Now, as I said at the start of this post, my impression is that the recession Hungary is now entering is likely to be a protracted and difficult affair. In order to justify this assumption (which we will have time enough to think about in due course) I would need to get into Hungary's very special demography - which I have attempted to do in my Just Why Is Hungary So Different From The Rest of the EU10? post. But, as you may have noticed, I have managed to write all the above with barely a mention of this contentious topic, so I think I will leave it at that for now. As they are want to say over in San Diego "Sufficient Unto the Day is the Evil Thereof". Reputedly that is just before they "whack" you, so, exercising caution as the better part of valour, I will now take my leave of you. Well my advice on this one - the galloping elephant part (you know, we've had the Tigers, the Lynxes, and the Giant Panda, and now its the turn of the Thundering Elephant to lead the global economy onwards and upward) - is not to try it. The very least that could happen is you get to fall off. But before we get into the full force of rhetorical frenzy here, I'm afraid that I'm not quite done yet with the Economist India correspondent (following my rather hamstrung attempt to caste myself in the role of Emile Zola at his expense yesterday), since as I said at the end of that post, our sterling correspondent, having failed to overheat anything beyond his own curry-ridden palate, has now moved on to what has to be the macroeconomic story of the year, the seemingly inexorable rise and rise of the Indian rupee. The rupee's rise may be less dramatic than that of the Philippine peso, Brazilian real or Turkish lira. But it is uncomfortable nonetheless. Quite so, just like a strong vindaloo without the de-rigueur mango lassi accompaniment a rising currency produces its own kind of dispeptic discomfort. But hold on a second, mightn't a rising currency in India actually be good news, and in any event inevitable? Nothing it seems is ever considered to be unmitigated good news where India is concerned in the eyes of our valiant correspondant, since everything needs to be tinged with its due and measured dose of schadenfreund. This vigour is due to a strong inflow of foreign capital, some of it enticed by India's promise, the rest disillusioned by the rich world's financial troubles. The net inflow amounted to almost $45 billion in the year to March, compared with $23.4 billion a year earlier. So he is pretty much to the point here - India's enchantment is in part a question of disenchantment with others - although I can't for the life of me understand why the latest data he has to hand is from back in March. Can't this guy ever do a professional job? Data up to the start of December is readily available on the Reserve Bank of India website here, and fascinating reading it is. Since this is a moment of almost historic proportions, perhaps my colleagues on this blog will be understanding and permit me a small break with tradition in actually posting an exhibit-A type chart. As we can see, and bearing in mind that the net inflow of external funds in the year to March - as proxied by the level of foreign exchange reserves held at the Reserve Bank of India - was $45 billion, the net inflow between 31st March 2007 and the start of December has been around $74.4 billion, or not that far from double the total amount that entered in whole fiscal 2007/2008 in just 9 months (and $41 billion of this since 9 August, more on why this date is important later) and fiscal 2006/7 was itself a very strong year for fund inflows, as we have already mentioned. All of this is, of course, simply staggering, but unfortunately, it seems, you aren't going to read about just how staggering it is in the pages of the Economist since over there we are still looking at last years data (the last time I cricised them they said I was cross, this time I am angry aren't I, does it show?). As can be seen directly from the chart, the money really started to flow in from mid-September and continued flooding in at a very fast rate until roughly mid November. The locus classicus on this whole state of affairs is without a shadow of a doubt Morgan Stanley's Chetan Ahya, and really it was this post of his which alerted me to the extent and significance of what was that was happening in India. 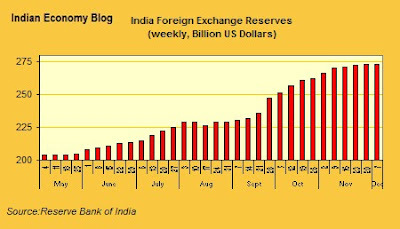 Over the seven weeks ending November 2, 2007, India’s foreign exchange reserves have increased by US$34 billion (annualized inflow of US$250 billion). Indeed, the trailing 12-month sum of FX reserves has increased to US$100 billion. 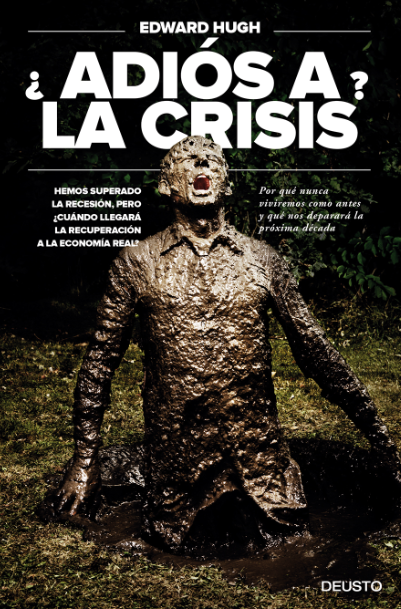 This compares with the average annual increase of US$38 billion over three years prior to these seven weeks. With the current account still in deficit, the increase in reserves is being driven largely by a spike in capital inflows and to a very small extent because of conversion of non-dollar reserves into dollars. During the last seven weeks in which FX reserves have shot up, we believe that capital inflows would have been US$35 billion. Out of this, not more than 10% has been on account of FDI inflows. Non-FDI inflows including portfolio equity and external debt inflows form a major part of these inflows. While the inflows are pouring in at the annualized run rate of US$250 billion, in our view, currently the country can absorb only about US$40-50 billion of capital inflows annually without causing any concern on attended risks of overheating. The key question policy makers are grappling with is how to manage these large capital inflows. As the strong growth in domestic demand has resulted in overheating of the economy recently, the central bank does not want to leave such large capital inflows fueling the domestic liquidity. Not surprisingly, the central bank has accelerated the pace of the sterilization by way of issuance of market stabilization scheme (MSS) bonds and an increase in the cash reserve ratio (CRR). Over the last 12 months, the RBI has sterilized about 58% of the foreign inflows. The sterilized liquidity (excess liquidity) stock including reverse repo less repo balances, MSS bonds, government balances with the RBI and the increase in the cash reserve ratio has shot up to US$77 billion as of end-October 2007 from US$19 as of end-October 2006. Now while the issue of whether or not India is now overheating once more raises its ugly head here, the context is now quite different, and it is clear that the Reserve Bank of India is having to struggle with a very different problem set from the one we were looking at back in the winter of 2007/8. The problems that may arise in the wake of such a massive influx of funds, and especially if the flow continues (or even increases further as it may well do if the problems the developed economies experience in 2008 turn out to be greater than appear to be the case at present), and doubly so the if India's attraction only rises further on the back of a discovery that not all the emerging economies are as structurally sound as they appear to be. The 9 August 2007 date is a significant (and even historic) one, since that is the day that French banking giant BNP Paribas announced it was suspending three of its funds -- Parvest Dynamic ABS, BNP Paribas ABS Euribor and BNP Paribas ABS Eonia -- since they were considered to be unduly exposed to US high-risk property loans. BNP Paribas Investment Partners, a unit of the French bank, chose that day to announce that the funds would forthwith accept no redemptions or subscriptions, and in making this announcement the so called "US Sub-prime Financial Turmoil" problem was born, and with its arrival the history of the entire global economy was given, it seems, a gentle turn of the page. One outcome of the Paribas decision that no-one perhaps envisaged when it was announced was that half a century of severe distortion and imbalance in global economic dynamics (you know, that old-hat "rich economy"/"poor economy" thing) might be given a hefty push in the direction of unwinding itself across a five to ten year window. Acceleration and recoupling is now the name of the game. (Since explaining all this involves getting involved a little bit in what the Bretton Woods II architecture is all about, as well as in the significance of what is happening in Japan, about which I have previously posted something here, and about what Bretton Woods III might look like, and how quickly it might now have to arrive, I will not enter more into this intriguing topic, but will save it for a separate post next week). Now I don't think it really needs saying that India is hardly to blame for the sub-prime blowout, or for the fact that the whole Bretton Woods financial architecture is looking extremely shaky at this point in time. One thing is sure though, and that is that given that money is leaving one place (some of the G7 type developed economies), rather than intentionally heading somewhere else, India now finds itself reeling under the weight of a quite sudden and unexpected inflow, which she may seriously be asking herself what it is precisely she has done to deserve, since what seems to be involved is some form of reversal the directional arrows normally though to be associated with the expression "capital flight". What is obvious to me at least at this moment in time is that, amongst all the growing risk you can see steadily accumulating itself out there (and here I would part company slightly from the Morgan Stanley China team, since I think the dial registering inflation risk in China is now starting to turn dangerously red) India looks to be as good a substitute for a safe haven as you can find these days. And so in the money comes. The question is that while India's new found growth potential and relatively tame inflationary environment is in part a by-product of the fact that the rupee has been allowed to steadily rise, the ensuing process is not, to use our Economist India correspondent's own euphemism, a comfortable one. And in the same way that the representatives of the European Central Bank express concern about "violent changes in currency values" - meaning by this the unduly rapid rise in the value of the euro - the gentlemen over at the Reserve Bank of India and the representatives of the Singh administration have every right to speak out plainly to the effect that countries like India and Brazil (for all their tremendous potential) simply cannot shoulder the whole weight of the massive global correction which is now in course. These are developing economies, and the whole path of their development process can be distorted or skewed by an excessively hot-house fashion injection of funds. In this sense I fully endorse the preoccupations being expressed by Chetan Ahya about the rate at which the inflows are pouring in. An annualized run rate of US$250 billion is simply enormous in an Indian context, and historically (in proportional terms) unprecedented anywhere I think. So regardless of the validity or otherwise of Ahya's suggestion that India currently can only absorb somewhere in the region of US$40-50billion of capital inflows annually without producing overheating risks (here we go again, my guess is that this number could be higher, but this is just that, a guess, since I certainly have not done the requisite studies, but who, in all honesty, really has, or is in a position to realistically estimate what is involved here. A brave man, I would say). This is not the moment to take all this off into those still very much uncharted waters. My friend and colleague Claus Vistesen recently had a stab at identifying some of the issues involved in this Compass and Charts Needed post. Clearly a coordinated and concerted response from the entire central banking community as well as from a rapidly enlarged G7 type forum is badly needed (was the case for enlargement of the G7 ever so clear as it is now, what the hell is Italy doing in there while India and China are out, our institutions simply are not keeping pace with events). I, for my part,only want to register here that something profound and important is taking place, and that there are no easy answers to hand. This is not simply a tepid repeat of events we have all seen far too often in the past, and recipes (which is what I fear we are being offered in the pages of the Economist) will not suffice (even if they are of the softer Chicken Tikka Masala variety rather than the undiluted Vindaloo one). Starting from this recognition, let the debate as to where we go next, and what to do about it, commence! A couple of weeks back I had the pleasure of seeing Alessandro D'Alatri's recent film La Febbre (Fever). As the reviewer says (Italian link), this is a 'normal' (everyday) film, not a great one, even if it does include one or two memorable moments, like the scenes shot along the river bank, which were (and I imagine this is not entirely unintentional) rather reminiscent of some which are to be found in the unforgettable L'Albero Degli Zoccoli from that giant of Italian cinema Ermanno Olmi. "La Febbre è il classico film italiano, che vuol raccontare una storia normale, di tutti i giorni, e che per farlo non trascende dai canoni della buona creanza del plot, e da quel pizzico di amara critica sociale che lo rende molto politically correct." My point of interest in this post, however, is not really the film itself, but rather the film as a reflection of something else: the disenchantment and frustration that many young Italians seem to feel with contemporary Italian society, and the impact that the evident failure of Italian civil society to adjust to Italy's contemporary social and demographic reality may have on the future evolution of Italian economy and society. On the aesthetic level the film is in fact far from satisfactory, since D'Alatri seems at times unable to be able to make up his mind whether he wants to be Rosselini or Almodóvar but this is in many ways beside the point here. La storia dell'impiegato Mario Bettini, geometra comunale come si definisce nel film, passa così tra luci e ombre attraverso gli amici, il sogno di aprire un locale, il posto fisso, la mamma e il fantasma del padre e il grande amore di una vita. 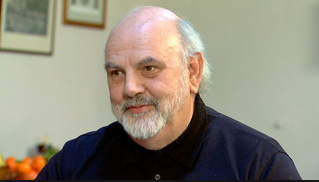 (This is the story of Mario Bettini, a municipal surveyor, as it appears in the film as a mixture of light and shadow as seen through the eyes of those around him: his friends, his dream of opening a bar, his steady-job down at the townhall, his mother, the ghost of his father, and, of course to cap it all, his 'sublime romance' with the love of his life). Well, what with mummy and all, this would seem to be the most ordinary of stories in an Italian context, and so it would remain were it not for the one incident in the film that really caught my attention. And the point of interest here are not the chiaroscuros of Mario's personal life, but rather the depiction of Mario as a young man who wants to succeed (at times desperately so), and all of all the trials and tribulations which are thrown in his path by a system which doesn't appear understand him, and which seems happier to see him fail than to see him succeed. 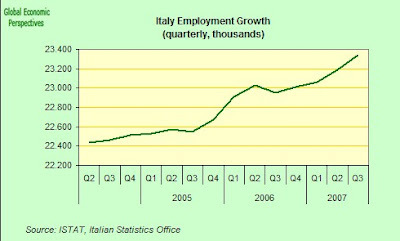 THIS, in my humble opinion, is one of the big problems facing Italy today. 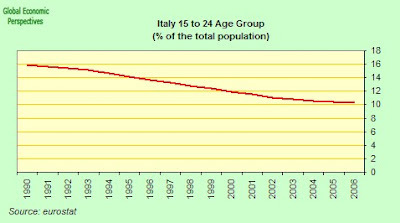 And it is this problem can be seen reflected in the large numbers of young qualified people who now feel the need to leave Italy every single year. Now, as I say, there is one very memorable moment in the film, and it is the one where Mario actually gets to meet the Italian president. The scene in fact takes place in Mario's bar, the bar for which he finally manages to get that vital change-of-use certificate (he is up, you see, against the typical system of municipal bureaucracy and petty corruption) thanks to the fact that a fortuitous visit by THE President means the local mayor needs his help rather urgently. When the President arrives our hero Mario naturally offers him a drink, and asks him what his poison is (this president, remember, is not called Putin): "una birra" is the reply, "una birra Italiana, como è bella la birra Italiana". So Mario furnishes the man with his drink, and then proceeds to inform him that there is something else, apart from the drink, that he would like to give him. At this point out from his pocket he whips, what else, but his Italian passport: "here, this is for you, I don't need it or want it" he says(or words to that effect). La fuga dei laureati italiani all'estero è un fenomeno di cui spesso si discute senza l'appoggio di dati significativi. Analizzando i flussi di laureati italiani che vanno all'estero il fenomeno appare drammatico e in crescita. Mentre all'inizio degli anni '90 meno dell'1% dei nuovi laureati emigrava all'estero, alla fine degli anni '90 circa il 4% dei nuovi laureati lascia l'italia. It is difficult to differentiate between people who are first, second and third generation Italian. 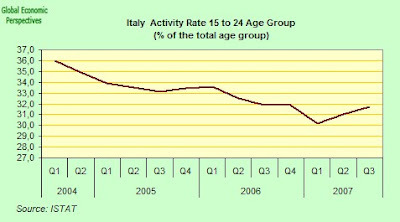 However, in terms of first generation Italians leaving the country: I found that since 1990 every year 4% of people who hold a bachelor's degree move out of the country to find job elsewhere; to this number you need to add some people who went to work elsewhere after high school, and MANY young people who did not register to AIRE (Association of Italians residing elsewhere) -therefore the government has no idea they are working somewhere else ... Could we estimate an average of 6% of the average yearly birth for people between the ave of 20 and 45 years old are leaving the country? 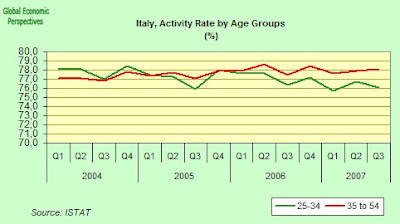 Now this state of affairs is a pretty significant one, especially in the light of the fact that Italy's population has not been replacing itself since the early 1990s (ISTAT, latest data, PDF link). 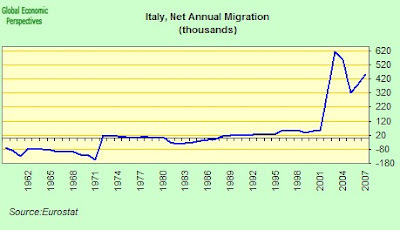 There is only a continuing population increase in Italy these days as a result of inward migration. But, as the Lavoce article stresses, the balance in human capital terms is hugely negative here. 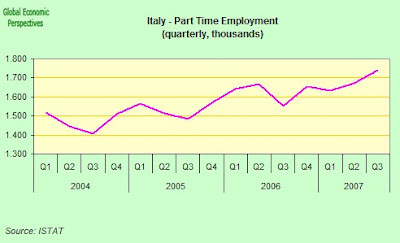 That is to say, the inward-migration that is currently taking place in Italy is extremely important in labour force terms, but this added man- and womanpower can only serve to make the path of the Italian economy a sustainable one if at the same time young educated Italians stay and enter the labour force in much more productive, higher-value activities. And it is precisely here that the big problem exists (and please note: this is not only a problem for Italy, since as I explain in this post here, a similar phenomenon is making its presence felt in Germany. Of course, the point should not be missed here that Italy and Germany are the two European societies which currently have the highest median ages, something whose economic importance and relevance I try to explain here). In conclusion, I am surely not the first to draw attention to this problem. Time magazine ran a feature on just this back in the spring of 2005, and economists Sascha Becker, Andrea Ichino and Giovanni Peri have attempted to assess the size of the human capital loss component, but what I am rather trying to do in this post here is to draw attention to the negative feedback element, in the context of the demographic processes which are taking place in Italy. At the end of the day it is far too simplistic to talk about Europe's Demographic Problem, there are problems and *problems* here, and there will be winners and losers, as some countries attract young talent to the evident detriment of others. 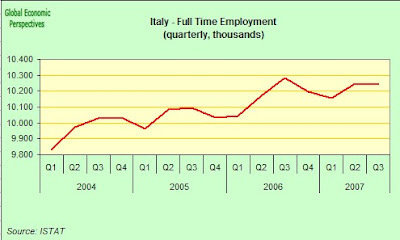 This is a modified version of a post which I originally put up on the Italian Economy Watch weblog, and if you want more examples from contemporary Italy about how the combination of power over petty regulations and local corruption can combine to bring unexpected results then you could try this post about Prato's new Chinese workforce. Unfortunately the paper is only downloadable for those who have access to a university server, but I would encourage those who can to read the full paper, since I think the differences of opinion here go to the heart of many of the important issues in the 'ageing' debate, and it is important to have both sides of the story. That being said, I think most of what follows is comprehensible even if you can't read the paper (especially if you use the FT article as a back-up). The ageing of the population presents a major fiscal challenge for the countries of Europe. The combination of increased longevity and a reduced birth rate will directly reduce the growth rates of the European economies by slowing the growth of the capital stock and by weakening the productivity of the labor force. This slower growth of GDP means a smaller tax base and less tax revenue. In addition, the current tax-financed systems of social pensions and health care will require substantial increases in the already high tax rates. The analysis in this paper shows that the common prescription of increased immigration would do little to reduce the future fiscal burden. The increased revenue from a large rise in immigration would finance only a small part of the coming rise in the cost of pension and health benefits. The only alternative to significantly higher tax rates or substantially lower retirement income is to shift from a pure tax-financed system to a mixed system that supplements the tax financed benefits with benefits based on increased saving financial investment. There may be many reasons to favour increased immigration....But it would be wrong to advocate increased immigration as necessary to deal with the fiscal consequences of an ageing population, or as a means to avoid large future tax increases or benefit reductions. On the first argument I want to suggest that Feldstein is simply wrong. Immigration is necessary to facilitate the handling of the fiscal consequences of ageing populations (where and for as long as it remains a possible policy option) in easing the process of transition away from Paygo systems. On the second he is much nearer the point, as I see it immigration is simply one part of a policy tool kit, a kit which also should include pro-natalist policies, increased retirement age, tax increases and benefit reductions. Some combination of all of these is necessary, the 'in the ballpark' debate centres around precisely what mix is feasible and desirable. Actually I would argue that the mix you can apply depends in part on the point in the demographic transition from which you start. Obviously if you are a country with a still comparatively young median age (say the UK or France at around 38) you have a far broader range of options in front of you than have Italy, Germany and Japan (whose median age has already risen to 43). Since the demographic transition is all about rising median ages, the importance of this point, and of acting sooner rather than later, should not be lost on anyone. Consider first the effect of slower population growth on the national saving rate. At any point in time, there are some households that are savers (i.e., consuming less than their entire after-tax income) and other households that are dissavers (borrowing or using up some of their previous saving). The savers are predominantly middle aged employees who are preparing for retirement. The dissavers are typically in their retirement years. In a growing economy there are relatively more middle-aged savers than there are older dissavers. That, together with rising per capita income, is what causes the saving of the savers to be greater than the dissaving of the dissavers. That difference between the saving and the dissaving creates a positive saving rate for the economy as a whole. The faster the population growth rate, the higher will the nation's saving rate tend to be. That explains why the aging of the population and the slower rate of population growth cause a decline in the share of national income that is saved. Now this argument is both right and wrong in my opinion. Basically what he is saying is true IN THE VERY LONG RUN. But it entirely misses the point that we on Demography Matter have been trying to focus attention on, which is THE TRANSITION DYNAMICS of the ongoing demographic changes. That explains why the aging of the population and the slower rate of population growth cause a decline in the share of national income that is saved. If we are to address this issue adequately then we need to start from the current reality, and from what we actually know of the economic dynamics of population ageing, and what better place to start than with those three famous prominent elderly societies that I tend to go on so much about - Germany, Japan and Italy. These three are important since they are the ones who have gone furthest with the transition. Now if we look at them as a group the first thing which we should note is that they are hardly to be singled out for an absence of savings. At the same time we could note that all those equally famous 'anglo' consumer debt societies - the ones where saving constitutes a pretty low share of national income - seem to share the characteristic that they are - in population median age terms - significantly younger. So what I think is that we have a calibration problem here in the application of the life cycle savings and borrowing model to populations (read Modigliani for the life cycle theory here), and strangely very few people seem to date to have woken up to this. Massive dis-saving may of course come one day (although this isn't as clear as it seems to Feldstein, since, and possibly for reasons like presence of bequest motives, people do not seem to dis-save that dramatically as they age). That ultimate theoretical possibility should not detain us too much at this point, however, since it should really be what happens before we get to the dis-saving median ages that holds most of our attention at the present time, since if some part of the whole demographic transition process is path dependent, then what happens earlier should be considered to be important as it may well influence what happens later. This lower rate of saving will in turn lead to a lower rate of investment in business plant and equipment. Although in principle Spain could in the future supplement its lower saving rate by importing capital from other countries, this is not likely to happen in practice for two different reasons. First, the other industrial countries are also experiencing slower population growth and that will cause their saving rates to decline. So they too would want to import capital and would not be in a position to shift capital to Spain. Moreover, experience shows that, oversustained periods of time, industrial countries invest what they save at home. So even countries with higher saving rates will tend to keep the extra saving at home. What he is actually missing here is that the demographic transition is in fact evolving in a very uneven fashion, and this can be seen from a quick glance at the respective median ages of the OECD countries. There will be, as Claus Vistesen is following, international capital flows (and here), and these will form part of the overall transition dynamics. Indeed it is here that we should expect the path specific components to be important in determining winners and losers. That is why (for example) this post from Claus is also interesting about the topic of growth and immigration, since it looks at empirical work from the Bank of England on the impact of immigration in the UK, and it is precisely this point about the impact of immigration on transition dynamics which I think more or less invalidates the thrust of the argument that Feldstein wants to make. Obviously if, say, Spain manages to leverage immigration to delay the arrival of a median age of 43 by 20 years then Spain will have bought time, and time in this case is very much knowledge, since we will have learnt a lot more about all of this twenty years from now. So what I want to argue is that while immigration certainly cannot solve the long term demographic transition steady-state problem, since high median ages eventually come to everyone, it is also important to bear in mind that here, as ever in economics, timing does matter (again, this appreciation is the real legacy of Keynes). As we all know only to well, in the long run we are all dead, but even if we imagine that at this point - in an extremely theoretical sense - as a species we are going to become extinct at the rate we are going given the steady extension of below-replacement fertility rates, this doesn't really mean that this has become an immediate issue, and sometimes it is worth focusing on immediate issues and leaving tomorrows problems for tomorrow's generations (always provided we do this responsibly). "An aging work force also lowers productivity growth directly. We know from experience that each generation of employees earns more than the previous generation. One reason for this is the improved level of education and of skills that the new generation brings to work. We are all aware of the greater facility that younger workers generally have in using computers and the internet. Younger workers also generally learn new skills more readily. So an aging workforce means lower increases in productivity from this source as well." This is noteworthy since there would many who would try to avoid drawing this conclusion, but as I attempt to argue in this post, there are sound theoretical reasons for thinking that Feldstein is right here. On the other hand Feldstein seems to completely miss another important part of the overall picture, which is the fact that we are currently seeing a dual process of weakened internal consumption in the elderly trio (Japan, Germany and Italy) and a chain of trade and international-capital-flow imbalances (that are in fact at the very centre of contemporary macroeconomic debate) which can very plausibly be argued to have something to do with the differential demographics of the various countries involved. "Asymmetric Demography and Macroeconomic Interactions Across National Borders"
This post on ageing and consumption on Italian Economy Watch and this one on the Median Ages issue also provide some further background arguments, as do this whole slew of posts on Japan from Claus Vistesen. Although there is general discomfort with some of the social consequences of increased immigration, many people have concluded that increased immigration is the "only way" to avoid a major increase in tax rates or a major cut in benefits. Now what I would ask Marty directly is just who these people are who have reached the conclusion that "the only way" to avoid a major increase in tax rates or a major cut in benefits is immigration (we wouldn't want to be demolishing a straw man, now would we?). 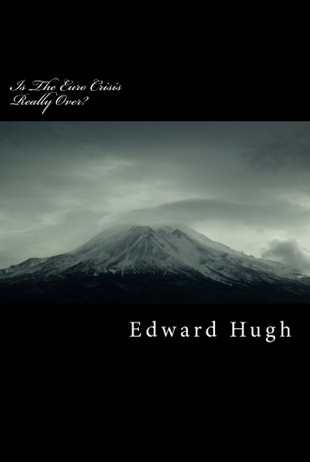 In fact I doubt that there is anyone who has seriously thought about the problem who thinks it is possible to avoid some measure of both spending cuts and increased taxation. Indeed immigration is not part of any "only way" strategy anywhere to my knowledge. Certainly the EU's Lisbon Agenda doesn't say this, and indeed far from it. Those of us who are on the Demography Matters Blog are perhaps among the people who have taken the 'positive impact of immigration' argument farthest, but to my knowledge we are only saying that immigration can *help*, and for the reasons outlined above (many of which Feldstein fails to appreciate the importance of). The presumed advantage of increased immigration as a policy response to the aging population is that it would help to finance the benefits of the aged. As I am saying, I don't think this is the *only* presumed advantage. Again it is obvious that immigration can help fund taxes in the short term, but the force of the argument about such immigration is that this short term benefit helps buy time and offers us all a pathway to try and equilibrate the global imbalances which, at the end of the day, are the heart of the problem. Stated differently, the increased revenue from a large rise in immigration would finance only a small part of the coming rise in the cost of pension and health benefits. And again Marty is not entirely off-target when he talks about the ways in which the Lisbon agenda is being interpreted at nation state level, and in particular in Italy, and Germany where a very heavy reliance is being placed on raising taxes rather than cutting spending, and as we may well be about to see this can prove to be very problematic, so I don't disagree with him at all here. But I'm not entirely sure that it is the Lisbon agenda itself that is responsible for this, as opposed to the ridiculous way in which the EU Growth and Stability Pact has been trivialized and effectively ignored. Of course this deaf ear will ultimately come with a price. Shifting from the current pure pay-as-you-go tax financed systems of pensions and health care to financing based on a combination of taxes and financial investments could reduce the burden on future generations of employees and taxpayers without lowering the standard of living of future retirees. 1/. The saving and investment consequences of a change in the way pensions are funded may not be quite the ones which Feldstein anticipates, since obviously (as he to some extent recognises) there will be consequences for the savings behaviour of the younger age groups. The changes will effectively mean that these groups have both to pay taxes to finance the outstanding liabilities to those who are already old and save for their own private pension plans. There is no doubt that this has to happen, but there are issues about how rapidly this can take place without crashing consumption. This is where the immigration argument does become important. Since Feldstein does not address the consumption issues he just doesn't see this part. In the US there is no doubt that any such savings shift would be beneficial, but then we get to the 'uncoupling' issues which so preoccupy Claus Vistesen. How does the rest of the world - and in particular those countries who need to run surpluses, handle this situation? Also, even though I have been drawing attention to the relatively high saving which is taking place in Japan etc, we really have no measure of whether these countries are doing *enough* saving in relation to the challenges they face (private saving has been in secular decline in Japan in recent years), and this is just one more topic which economists in general need to start getting to grips with. But if such countries need to start to save even more, what does this imply for the level of exports they will have to depend on, and where exactly will all these exports go? But because the rate of return on an investment based account is much greater than the implicit return in a pure tax-financed system, the amount of saving that is needed is much less than the amount of additional taxes that would otherwise be required. Again formally speaking this is surely true, but just what rate of return can be offered? No-one really knows. In fact the issue of just the level of the rate of return on private pension funds is much more a problem than that old bogey of 'stock market meltdown', but the problem isn't being thought about sufficiently. Actually the whole central bank debate about global liquidity has something to do with this (and I can't help asking myself whether in the background the central bankers are not in fact bright enough to be actually thinking about this one), and clearly the savings glut is also to do with the investment dearth, but how do you maintain a good rate of return when the ratio of savings to investment rises sharply globally. The whole debate about increasing risk appetite and emerging markets is surely to do with this. So with increasing dependence on private schemes this problem would only grow, as the level of funds looking for a viable rate of return will only increase, and struggle as they might the central bankers will find it hard to push interest rates up significantly with so much liquidity floating around. This is why I feel putting the focus on global imbalances is so important in this context, and it is also why I think it important to find policy solutions which take the imbalances as their starting point, since they are surely at the heart of the problem. One last small gripe: why do people keep putting the focus on this as a purely European issue? (Note the title of Feldstein's paper). Declining fertility and increasing life expectancy is a global phenomenon, and if we are ever to find a way of adequately handling population ageing then I think we need to see this as a global, and not a national level problem. The real issue posed by the pyramid inversion which is associated with the ongoing demographic transition is actually how to shift from a paygo to a post-paygo environment with the least possible collective damage. That not everyone in the United States has quite the limited perspective on this that Marty Feldstein seems to have can be seen from this recent speech from Ben Bernanke. There's a lot of interest focusing on the future evolution of the Eurozone economies at the moment. Claus Vistesen has been following the debate closely on his blog (and in particular this post). Many observers are at this point fairly optimistic about the future of the eurozone economies as a group, but, as I keep pointing out, domestic consumption in both Italy and Germany continues to remain weak, and there may be sound theoretical reasons for assuming that this situation isn't going to change, and at the same time these two countries also face fiscal tightening problems as we enter 2007, due to the costs imposed by their rapidly ageing populations. Many Eurozone countries indeed need structural reforms .....Yet the thing we must ask ourselves is whether this will be enough? And this dear readers is where demographics come in and more specifically why we need to look at the population structure of for example Germany and Italy in order to really understand what is going on before our eyes. Why for example is consumer spending persistently low in these two countries and why is Germany running a trade surplus of 6% of GDP. Of course, the ageing population in Europe is not a topic which has just appeared on the center stage of economic discussion and neither is the need for structural reform in Europe. In fact, these two aspects are often tied together; in order to amend the effects of an ageing population we need structural reforms on the labour market (to free up ressources), pension systems (cost cutting), and health care systems (cost cutting). The last two cannot be accomodated by slashing benefits all together and as such fiscal tightening is an integral part of this; just look at Italy and Germany at the moment. But will structual reforms really neutralize the effects of ageing population effects in Europe? The bets are still out but I would argue that this is highly unlikely. Now there is a lot of talk about Germany and Italy here, and there are of course other countries in the 12 nation zone, in particular Spain and France. In fact France is an interesting case here, since in theory France's ageing problem is a lot less severe in the short term than that of either Germany and or Italy, and indeed in recent years, and despite having carried out a lot less in the way of structural reforms than Germany, French GDP growth has consistently outperformed the other two. Which is why it was really something of a shock when France turned in a zero % third quarter GDP growth reading. Not that it should have been a complete surprise, since the slowdown in the rate of increase in industrial production in France in June and July was already something of an early warning for those who were watching. French industrial production unexpectedly fell in October after economic growth stagnated in the third quarter. Production at factories, utilities and mines fell 0.1 percent from September, when it fell a revised 0.8 percent, Insee, the national statistics office, said today in Paris. Economists expected a gain of 0.5 percent, according to the median of 22 forecasts in a Bloomberg News survey. Manufacturing of machinery and equipment fell 0.2 percent. France's economy failed to grow in the June-September period, resulting in the smallest job creation since the second quarter of 2005. The 8.8 percent jobless rate, though down from 10.1 percent in May 2001, remains the highest in the 12-country euro region, according to Eurostat. 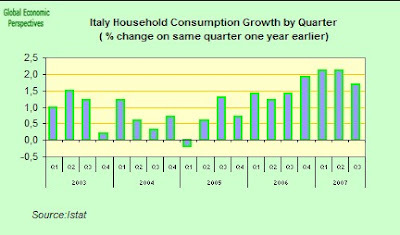 So we could draw the conclusion that the French economy could survive better if internal consumer demand in some other eurozone countries was stronger, but since this isn't the case the weakness in consumption in Italy and Germany then feeds back into France. France's trade deficit widened in October for the first month in three as the rising euro undercut exports and boosted imports. The shortfall grew to 2.71 billion euros ($3.6 billion) from 1.51 billion euros a month earlier, the Trade Ministry in Paris said today. French economic growth will slow in the first half of 2007 as foreign demand cools, the national statistics office forecast. The world's economic expansion will fade in 2007 to its weakest in four years, dragged down by a U.S. slowdown, the Organization for Economic Cooperation and Development said last month. Insee sees exports of manufactured goods rising 1 percent in each of the first two quarters, down from 2 percent in the last three months of 2006. Import growth will also slow to 1.5 percent from 2.2 percent, it said. So what we have at the moment is indeed a curious situation as the two weaker economies continue to outperform what has, until now, been thought to be the rather stronger one. My own view is that in the course of time things will return to their natural order and Italy and Germany will underperform France in 2007 (and possibly by a wide margin) but for the time being we remain with the enigma, which is undoubtedly in some way associated with continuing euro strength. So it will now be interesting to watch this situation moving forward, and particulary over at the ECB where we may reasonably expect enthusiasm for further rate rises to begin to cool notably. 1/. Consumption has some (variable, not precisely quantified) life cycle component. You can find some background to this by following the links on this wikipedia page to Francisco Modigliani who got the Nobel Prize for his ideas on this topic. Basically the idea is that saving and consumption patterns vary across the life cycle, and this is just as true for populations as it is for individuals. The clearest evidence for this effect is coming from the relatively elderly societies (Italy, Germany and Japan) where domestic consumption consistently fails to show robust growth. 2/ This inability to maintain consumption growth in the elderly median age group has the consequence that these countries need to export to grow. Again, you can try this one from Claus, or if you want a more theoretical treatment you could try the paper Asymmetric Demography and Macroeconomic Interactions Across National Borders presented by Ralph Bryant at this Reserve Bank of Australia conference. As Claus indicates this need to export is pretty obvious in the cases of Germany and Japan, where substantial surpluses are being run, but it is also becoming obvious in the case of Italy where the inability to run surpluses means that the public debt is spiralling out of control, since without export surpluses of sufficient magnitude there is insufficient growth to finance pension and health liabilities. 3/ Lastly median ages are important as they reflect the age distribution of the population, and the age distribution is important for productivity performance, as I explain in this post here. So there is ample theoretical support for the idea that median ages have macroeconomic consequences and we can find empirical backing for this theoretical espectation in the relative performances of countries when they are examined according to median age. I would say that if a society has a 'golden age' in growth rate terms, then this age seems to be somewhere in the 33 to 38 age range, with Ireland and Iceland marking the bottom end of the register, Australia and the United States occupying the middle ground, and the UK and France being at the upper end. Perceptive readers will note that all these societies have experienced notable increases in property prices over the last cycle, indeed they are more or less the developed societies which have been most credit-driven, which is pretty logical really, since younger people are inclined to borrow more. Below Ireland we have the wanna-be developing economies, most notably China, but also Thailand, Brazil, Turkey, Chile, India etc. Indeed more or less all the countries which are suddenly experiencing over-par economic growth have median ages in the 28 - 33 (demographic dividend) age range. Then if we move on up, into the 40 - 43 age range we find countries which appear to be moving towards the rather more sclerotic internal consumer growth/congenital need to export/no housing boom group. As I have already said, the three oldest countries - Japan (42.9), Germany (42.6) and Italy (42.2) - seem to share the common feature of slow GDP growth, weak internal demand growth, and an increasing dependence on exports to drive domestic growth. They also share the common problem of acute public finance pressure as they try to leverage there way out of paygo based pension systems at the same time as the population pyramid inverts. So, at least in empirical terms, it might now be interesting to start to follow the next countries on the list - Finland (41.3), Bulgaria (40.8), Sweden (40.9), Belgium (40.9), Greece (40.8), Austria (40.9), Slovenia (40.6) - to try to examine whether or not this pattern is repeated. Obviously the key parameters in play in determining median age are immigration, life expectancy and fertility, and median ages will move according to the movements in these three parameters. On life expectancy all the above countries can expect this to drift upwards, so the upward movement in median ages will only be reinforced here, with evident differences from one country to another. Only Greece, Bulgaria and Slovenia have lowest-low fertility (the rest are below replacement, but in the 1.7 - 1.9 range) so the others shouldn't expect much in the way of a fertility boost, and Bulgaria has been loosing so many young people of child bearing age (and seems set to lose more with EU accession) that it is hard to see any big impending rebound here. Then there is immigration. This I think tends to be driven by job availability which is driven by economic growth. In the group Greece has been having substantial inward migration in the last years, so this may be important in changing the trajectory, if the growth can be sustained. But remember that Greece is another country with a very large debt/GDP ratio, and there will need to be fiscal tightening at some point. So the stellar growth factor isn't guaranteed. Sweden and Finland may attract migrants, and they may do this at the expense of some of the Eastern European 'Lynx' economies (and maybe even at the expense of a country like Germany, if the Germans don't wake up soon), so this will be interesting to watch. Belgium definitely seems to be pretty immigrant-hostile right now now, so unfortunately it looks set to go the way of Germany. Bulgaria and Slovenia could easily suffer from strong out-migration, which will simply make the median age rise more rapidly. Indeed Bulgaria may already have a significantly higher median age than the official one, since there have undoubtedly been many more Bulgarians working out of the country than the government is prepared to admit. And both of the above countries may obviously find themselves directly in the line of fire from events in Hungary in 2007 (in anticipation of which I have now started a new Hungary Economy Watch blog). It will also be interesting to follow the evolution those countries who seem able to change course if they act in time, like Spain (39.9), Denmark (39.8), Netherlands (39.4), France (39.1), UK (39.3). Again Spain is almost certainly younger than the official numbers indicate, since the recent immigration has been massive and is probably not yet reflected in the stats, and this immigration has undoubtedly fueled the recent housing boom in Spain. Both the UK and France have it perfectly within their grasp to change course, especially given their capacity to assimilate immigrants (which some dispute in the French case I know, but I think there is plenty of room for debate here) and their relatively higher fertility. Denmark and the Netherlands could, but the open hostility to immigrants you can often see in these countries seems to me to be a bit like shooting yourself in the foot (sorry Claus, but we will see). My guess is that as the fate of the 'leading group' becomes more and more apparent the climate will change rather dramatically in this regard. Hungary, otoh, is still a little 'younger' (at least officially, 38.7) but this could also change dramatically if the economic situation there in 2007 sends people rocketing out. 175,000 Argentians came to Spain in 2002 alone, and a lot more young Argentinians obviously went elsewhere. So this is where macro-economics and demography definitely interact. Lastly I would mention Switzerland, which while having a slightly lower median age (40.1) the the three oldest-old societies has long suffered from some of the macro consequences of ageing that I have been trying to spell out (eg they have had a virtual ZIRP approach to interest rates). So what I am doing is sort of pointing to a research agenda. Maybe using median ages seems to some to be horribly simplistic, but it is amazing to me to see just how much you can explain with such a simple measure, and how little of what is happening can really be explained by its rivals. At the end of the day one of the things which is important about hypotheses is that they should be reasonably testable. I have made some tentative forecasts here. Now lets go and see what actually happens in the real world. 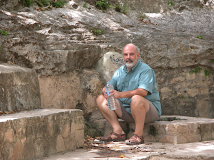 This post was originally published on Demography Matters. Today we learn of the sad death of Ferenc Puskás at the age of 79. Puskás was undoubtedly a great footballer (you can find an interesting page about him on wikipedia) and he will be missed by family and football fans alike. Puskás reached the comparatively advanced age of 79, and we hope he enjoyed his later life. We may also like to note that Puskás lived considerably longer than the majority of Hungarian men, since the average male life expectancy is currently some 68.45 years. And it is here that the economic part of our story begins. Life expectancy in Hungary continues to be comparatively young by European standards, so it is to be hoped that in the coming years this situation will improve considerably, but how exactly will this improvement affect the economic outlook for Hungary, that is also the question? “We see if the modification would get approved it could lower the payment obligation of both Egis and Richter arising from tax on drug subsidies to HUF 1.5bn (when compared to the earlier version of 14%-16% tax resulting in HUF 2.0bn) and to HUF 2.4bn (when compared to the earlier version of 14%-16% tax resulting in HUF 3.3bn) for 2007 respectively," KBC's Barbara Jánosi said on Friday. She added this step would be only a little positive development for these two companies when compared to substantial increase seen in their payment obligation from co-financing the gap of the drug subsidy budget. According to the Parliament's latest decision, next year's drug subsidy budget target will be HUF 287 billion when compared to HUF 364 bn reported earlier by the Finance Ministry. “We see the lowered target could lift substantially the budget gap for next year resulting in higher payment obligation for drug makers (if no changes will be in the distribution principles of the gap between industry participants)," Jánosi added. Now it is clear that with this current comparatively low life expectancy some considerable improvement is to be hoped for and expected. If we take a look at a comparable society, the old east Germany, we can see that such an improvement can occur relatively quickly, if the right care and clinical environment is available. So on the face of it a convergence of Hungarian life expectancy towards levels which are regarded as rather normal in the West European parts of the EU is to be expected, but we need to think about how this can be paid for. Now many attribute Germany's current public finance problems to the incorporation of East Germany, and this view is *both* right and wrong. It is wrong in the sense that it doesn't take account of the fact that ageing is an *all Germany* phenomenon, but it is right that the rapid increase in life expectancy that took place in East Germany in the 1990s simply piled on, and piled on the costs, and this must be a big part of the current financial crisis that the German health system is experiencing. So all I am saying at this point is that the sum total of these effects will make the managing of the Hungarian deficit issue a bigger rather than a smaller headache, and the sooner the body politic in Hungary wakes up to this the better. In what follows I intend to step back from the precipice a bit, and take a rather longer term look at one feature of Japan's economic performance, its labour and employment market. 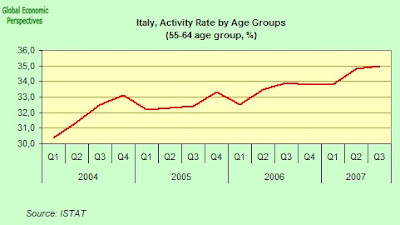 In this sense this post is going to form part of a "tripple whammy" I am working on, where I will attempt to carry out an in depth examination of possible connections and interconnections which may exist between population ageing, rapid job creation and weak internal consumption in three key G7 economies: Italy, Germany (see here) and Japan. Well lets start by looking at the story so far, at least as far as Japan goes. Fortunately we do have a number of key stylised facts at our disposal. 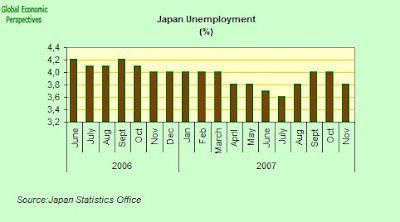 First off, unemployment has been steadily - I could say relentlessly - dropping in Japan since reaching a peak in 2002. And since the start of 2006, we have seen this decrease continue almost month by month until the market seems to have turned, sometime around July 2007. 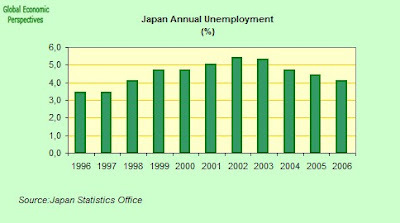 Since that point it would seem that conditions in the Japanese labour market have been steadily worsening.